As you probably know, my birthday was this past Saturday and boy, was it a good one! It even included homemade butter pecan ice cream (scroll down for recipe)! Anyway, I had a wonderful night’s rest, which included sleeping with my bedroom window open, and woke up to the sound of birds chirping outside. It was a refreshing start to my day and made me smile. Then, I got ready for yoga and headed over to my studio. After yoga, I came home and made myself a wonderful breakfast. 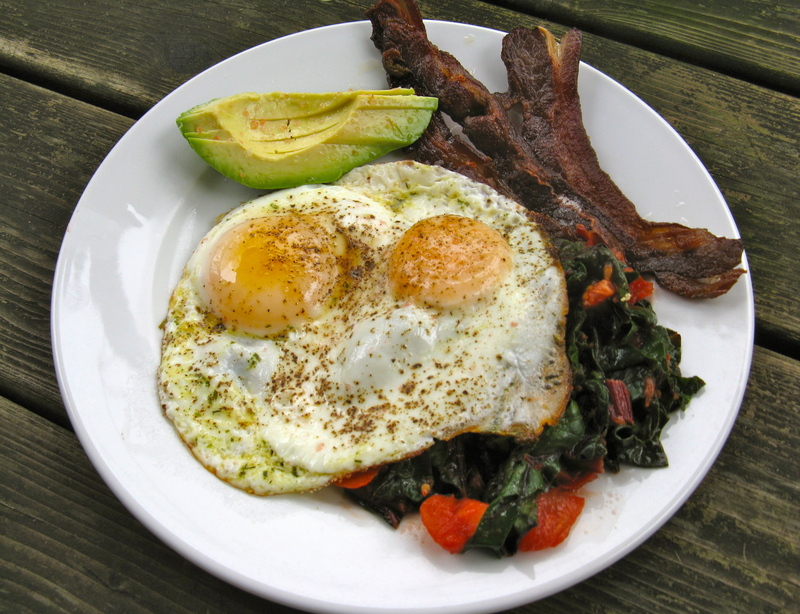 US Wellness Meats sugar-free grass-fed beef bacon, pasture-raised eggs cooked in garlic n’ herb pasture butter, avocado, and red chard and tomato cooked in the bacon grease. Then, I got a surprise phone call from my 87-year old grandma and 90-year old grandpa back in Michigan. It was so touching and wonderful to hear their voices. Apparently, my dad was on the phone with them earlier in the day and asked if they wanted to call me on my cell and wish me a happy birthday. I’m so glad he offered up the idea! I love my grandparents dearly and they’ve always been a big part of my life. Next on my agenda, a pedicure! 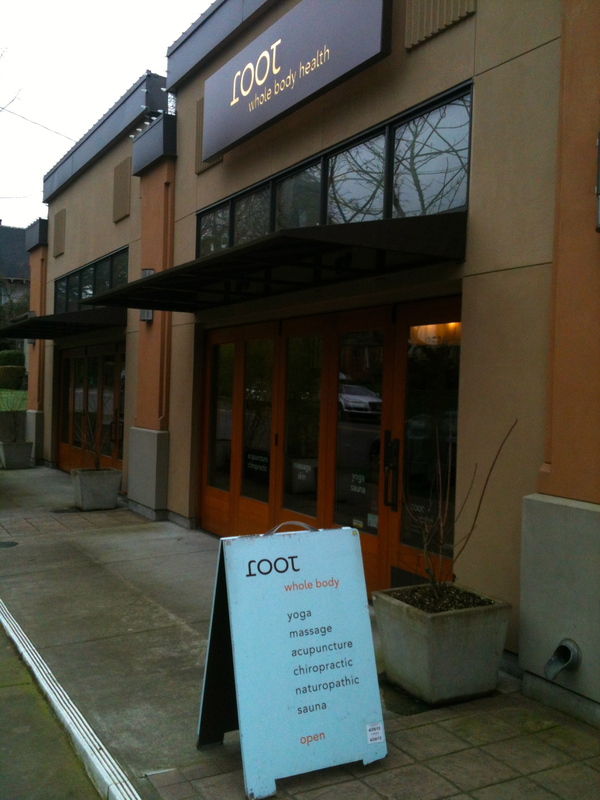 I treated myself to a little TLC at a salon/spa down the road from us — literally just a 5-minute walk away. The day continued with a drive up to Cultured Caveman for some chicken tenders. I LOVE their chicken tenders. They are crave-worthy. They’re dipped in a thin layer of coconut flour, egg white and spices, and then fried in grass-fed beef tallow. Garnished with course salt and dipped in homemade ketchup and/or aioli, they are divine. 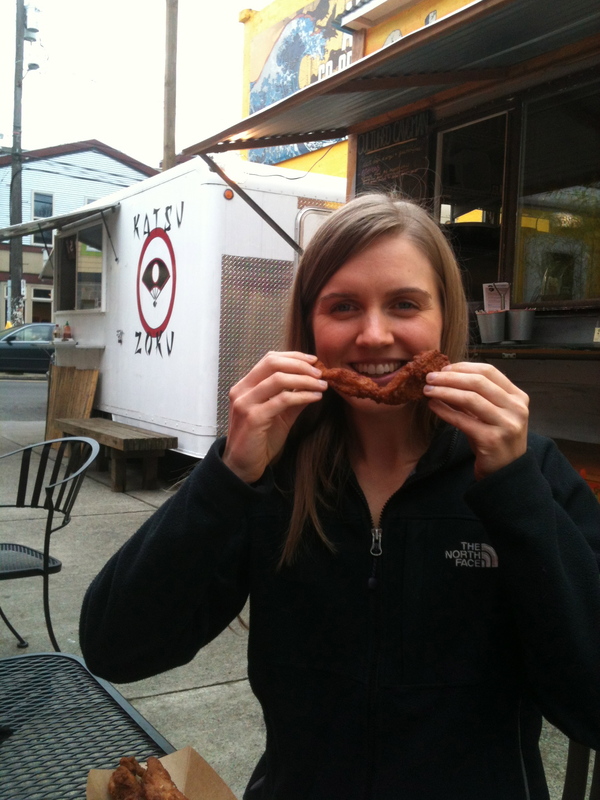 If you live in Portland and have not tried their chicken tenders and other delicious food, do it! And try some of my date/nut treats while you’re there! Next, grocery shopping at Whole Foods. Enough said. Afterward, I hung out a home and did a itty bitty amount of homework. Then, I decided I wasn’t having any more of that on my birthday and put it away. 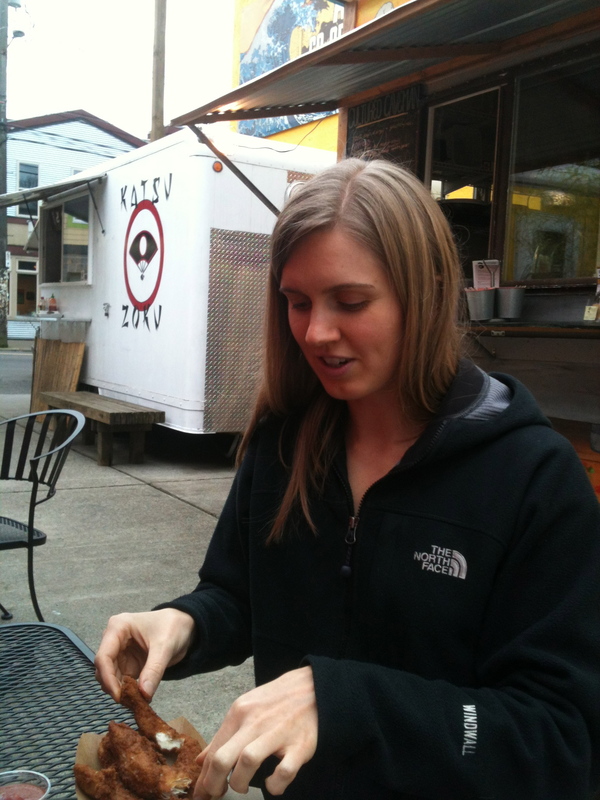 For my birthday dinner, we went to Cafe Nell, one of our favorite restaurants in Portland. We drank the loveliest chardonnay I have ever tasted and shared egg on horseback, minus the cheese. This is asparagus with a sunny side up egg and sage brown butter. For dinner, I had NY strip with roasted Brussels sprouts. My phone pictures were really bad in here, especially the one I tried to take of my entree, so I don’t have a picture of that. 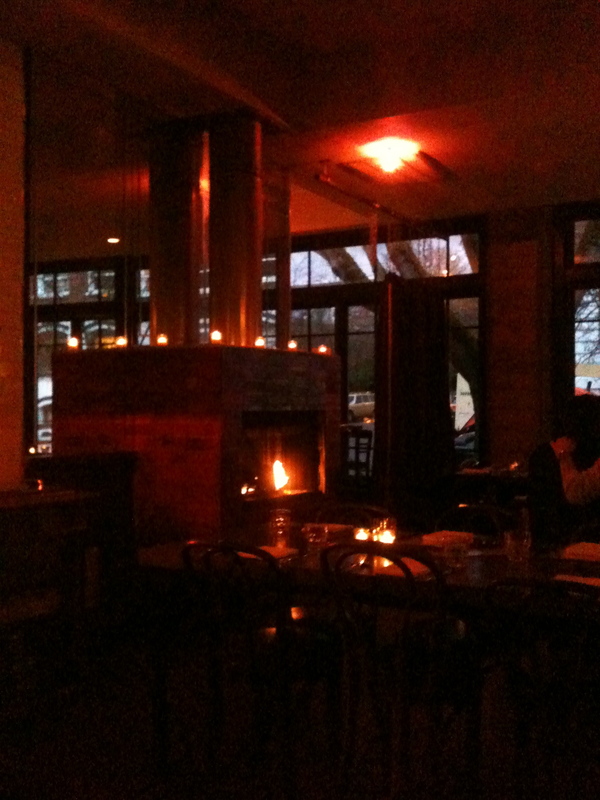 Dim lighting, a cozy fire and lots of windows. The European feel of this place is one of my favorite things about it. After dinner, we came home and ate some homemade butter pecan ice cream that I made earlier in the day, and watched the final episode of season 1 Downton Abbey. I had been wondering what all the hype was about this show and kept hearing people talk about it. Jesse and I finally checked it out a couple weeks ago and loved it! You know what’s really funny? Up until watching this show for the first time, I thought it was called, “Downtown Abbey.” Am I the only one? 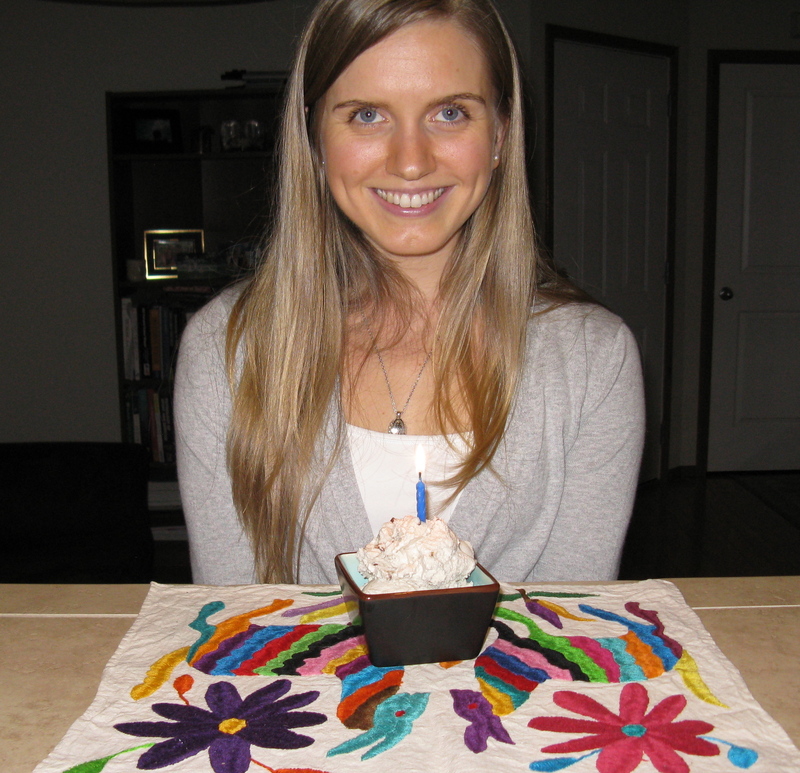 I had such a lovely birthday and feel so blessed. I’m just sad that it went by so fast. Now, it’s just a memory, but a good memory indeed. Melt the butter in a small skillet over medium heat. Add the pecans and let toast, stirring occasionally for 3-5 minutes. Set aside to cool. The pecans will continue to absorb some of the butter while cooling. Meanwhile, whisk egg yolks, coconut milk, honey and sea salt together in a small saucepan over medium heat. Continue to cook for a few minutes, stirring occasionally. Remove from heat and stir in the coconut cream, vanilla and pecans. Place in the fridge to cool for a couple hours. Once chilled, add to ice cream maker and let churn for 17-20 minutes. Serve right away or empty into a container and store in the freezer. Love this and you look so gorgeous in your photo :-). Happy 28 years!! happy birthday! glad to hear you had such a great day, full of all of your favorite things and some surprises. If you have amazon prime, you can check out downton abbey, season 2 on their video streaming for free. Have you checked Hulu as well? Thanks, Nikki! Good to know about Downton Abbey. I thought Jesse checked Hulu, but now I’m not sure. How many seasons are there right now? I thought the second season was currently on, but apparently I’m wrong! I don’t know these things! They just finished season 3!!! I think you should definitely be able to find season 2 somewhere. Although, I thought season 2 was a real “down”er compared to season 1. That icecream recipe looks amazing! My roommate has an ice cream machine and is moving out soon, I am going to have to make this before she leaves! Happy belated birthday Alisa! Happy Birthday! As my gift to you, I can tell you that all 3 seasons of Downton Abbey are available on DVD on Netflix already. Each season actually comes out on DVD the same time it hits US television, so I watched all of season 3 before my friends saw the episodes on TV. So, move them to the top of your Q! Happy Birthday! As my gift to you, I can tell you that all 3 seasons of Downton Abbey are available on DVD through Netflix right now. No wait necessary. Just move them to the top of your Q. Happy birthday Alisa! You look so happy and healthy! Happy Birthday! And here’s to a great year ahead! That ice cream looks scrumptious! I’ll be making it myself once I finish the GAPS intro diet! I look forward to the next recipe. Thanks for fowwing my blog. It means a lot to me. I’m new at this whole thing. Me and my guy fell in love with downton abbey too !! Netflix is amazing 🙂 happy belated birthday ! Yes! We just started season 2 last night. So far, so good!